Presenting the latest Ben 10 game to all the superhero fans out here. It is the Ben 10 Steam Camp! The Steam Smythe has ruined a beautiful evening for all the citizens in the city park. Destroy Steam’s robots and lift the citizens to the safe place! Ben is on another mission to save the city in Ben 10 Steam Camp game and this time he transforms into Stinkfly. The evil and furious robots of Steam Smythe have attacked the beautiful city park. Now, it’s up to Ben 10 to save their lives. As Stinkfly, Ben decides to lift them up and make them reach the Rustbucket to run away safely. Are you ready for this guys? Wait, do check out the gameplay below for some tips! Recommended: Play Ben 10 to the Rescue Game online for free now! Ben 10 Steam Camp is a multi-level game but unlike other ben 10 games, there is only one alien that you can use for playing i.e. Stinkfly. But don’t worry, Stinkfly is powerful enough to battle Steam’s robots. In every stage, Ben 10 begins from the one end of the park and goes around to rescue the number of people as indicated. There are two types of bots you need to destory – Robots and Megabots. The victims will be running around for help, you must fly downward, pick them up and release them beside the Rustbucket. Pro Tip: Collect the Yellow Omnitrix card to get immunity from Robot attacks for 60 seconds. Remeber, the level will complete only when you rescue all the people in the park. The number of people to rescue increase after every level completed. That’s all. Now, you are ready for the mission and save the citizens from Steam Smythe’s robots. Destroy Steam’s robots and lift the people in the camp park to a safe place. Good Luck! 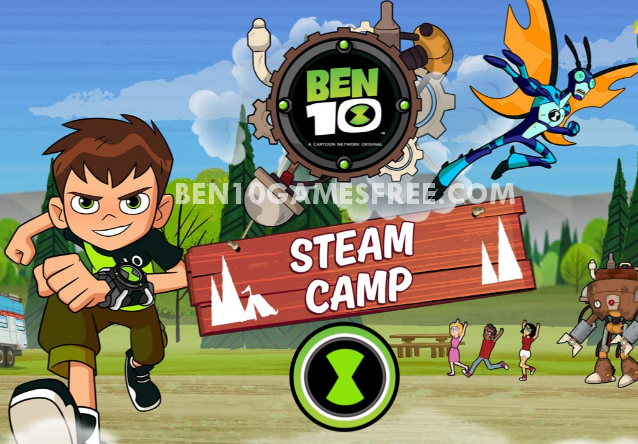 Don’t Forget to give your rating for Ben 10 Steam Camp game and share your tips and tricks to win this game in the comments section below.